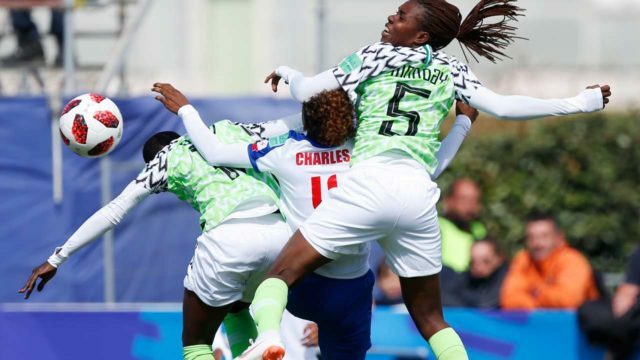 Goalkeeper Chiamaka Nnadozie was Nigeria’s heroine yesterday as the Falconets defeated Haiti 1-0 to rekindle their hope of qualifying for the second round of the on-going France 2018 FIFA U-20 Women World Cup. After losing their opening matches on Monday to Germany and China respectively, Nigeria and Haiti needed victory to resuscitate their ambition of moving to the second round. Both teams knew the implications of another loss and therefore went for the kill early on in the game, but neither side had the cutting edge until the 36th minute when Nigeria saw the breakthrough through Skipper Rasheedat Ajibade. Nigeria was awarded a penalty kick after Anam Imo was fouled in the area by Haiti’s Dougenie Joseph and Africa’s top scorer in qualifying for France 2018, Ajibade made no mistake when presented with the opportunity and converted what turned out to be the winning goal from 12 yards. Haiti responded to going behind almost immediately but the post denied No10 Nerilia Mondesir after a swift counter-attack. The Caribbean side continued to push for the equaliser but Nnadozie proved to be equal to every challenge that came her way. Germany’s 2-0 defeat of China in the other Group D game of the day opened the doors for Nigeria’s passage to the second round, but the Falconets, now second in Group D with three pints from two games, must beat or draw with third-placed China on Monday in Dinan/Léhon to actualize that dream.